Families with Kids having a blast Dorado Fishing. 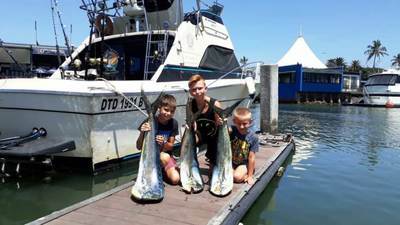 Home | Browse | South Africa | KwaZulu-Natal | Durban | Families with Kids having a blast Dorado Fishing. As a skipper there is nothing that satisfies me more than when we take kids out fishing with Mom and Dad and we get them hooked up into a nice Dorado for the first time in their lives. Many times it is their first experience at sea, and for me to see their shear excitement, and amazement when they hold on to that rod, sometimes with Mom and Dad’s help and the exhilaration when that brightly coloured beautiful Dorado comes on board totally makes my day. On both Fat Girl and Nawty Girl these Kids had a blast.